Equitable change—the type that represents real and lasting solutions for all those involved—requires high levels of collaboration and inclusivity no matter where you’re working. This is especially true with something as complex as the food system. Yet much of the change around how food is grown has been driven by the few, instead of the many. Once industrialized farming took hold in the Industrial North, farmers began to rely on agricultural experts for the latest technologies and scientific farming practices, thus creating a top-down approach. It’s an expert driven model that distributes the newest, formally researched and developed innovations to farmers, often creating large new expenses that the farmers have to assume. Even more, this model is motivated by a one-size-fits-all production of goods versus the specific needs, capabilities, and capacities of a specific farmer in a specific region. This one-size-fits all approach rarely takes into account local knowledge, culture, and community wants and needs. Furthermore, it creates a scenario in which farmers turn into beneficiaries dependent on government funding instead of creators of solutions to their own problems. However, this hasn’t been the only way innovations have been created. Traditionally, smallholder farming communities worked together, sharing localized innovations and best practices with one another in a horizontal and collective spread. For the last 30 years, most agricultural technology used in developing nations came out of informal innovation by farmers and this remains true today. So why don’t we hear about these innovations and instead only hear about innovations created by formal research and development (R&D) agencies? This is because there are two cultural paradigms taking place here. The industrial paradigm, which includes the R&D agencies, views farmers as beneficiaries of knowledge as well as new markets for industrial inputs and products such as chemicals and proprietary seed. On the other hand, the participatory paradigm, which is not recognized by the industrial paradigm, views farmers as growers, innovators and caretakers of our food, community, and environment. To the industrial paradigm, those within the participatory paradigm are not approved researchers and experts so their innovations remain hyper-localized and unaccounted for. Since the advent of industrialized farming, transferring knowledge to farmers has occurred through agricultural extension service agents. Extension organizations are mandated by large agricultural research and development agencies such as state universities and agrochemical companies to support research and development of farms. These agencies focus their services on increased production, soil protection, and other climate factors, as well as the economic livelihood of farmers. While this sounds well and good on the surface, deeper reflection reveals that these services are offered through an economic lens that is driven to increase consumption of industrial inputs such as pesticides, feed, fertilizer, and fuel. The role of agricultural extension has created a one-way funnel of new, one-size-fits-all information treating the farmer as a passive receiver and not an active participant within their own community. This approach has had limited effects and over the years smallholder farms in the Global South have reported feeling colonized and patronized. Equally damaging is the economic impact on farmers when wrapped in this paradigm. Industrial inputs are expensive and once a farmer begins this path they enter a loan and debt hamster wheel, creating a cycle of poverty and shame. There is a latent paternalism in doing things for another culture instead of that community finding it’s own way. It creates feelings of dependency and the inability to figure out one’s own problems. While extension and researchers have touted that their goals have been to help the farmer, the cultural paradigm from which they operate hinders more than it helps. Extension intervention has been noted to be directed by what researchers think farmers need instead of by actual site-specific needs. The expert-driven approach creates a relationship in which the farmer loses her local capacity to innovate and creates a feeling of dependency on people outside their community. The inherent complexity of the extension agent’s position is that they are there to help the farmer, but within the industrial paradigm, the local knowledge embedded in the community is not leveraged into action and threatens to be lost. For all these reasons, groups such as donors and policy makers are adding pressure for new approaches that make their work more useful to smallholder farmers. Because of this many organizations are trying to find ways to engage with farmers in a more meaningful way. There already is an approach that would solve these concerns and as was mentioned has existed long before formal R&D came on board. 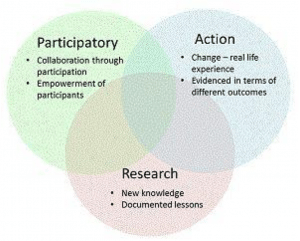 There are many models for participatory research and they hold the same values: a democratic and horizontal approach to change that is community-led and involved. The participatory paradigm breaks down the expert-driven model and states that we can all be experts at any given moment; we can all provide solutions and innovations. This paradigm is driven by community-based solutions that fall under participatory research and action or participatory action research (PAR). Some key components of this method are that facilitators may be from outside the community, but they cannot lead or dominate the discussion. The PAR must be open and based on the needs of the community. This includes what information is discussed and how the information is documented and shared whether that be through visual, dance, or written means. These models have been used in varying fields, such as therapy, education (as in Waldorf schools), policy (Brazil’s Food and Nutritional Security Policy), and farming. This is a paradigm shift in how we work together. Participatory action research creates equity and empowerment based on real life experiences and site-specific outcomes and solutions. Within farming, one of the participatory approaches used is called farmer led documentation (FLD). The methodologies it stems from are Participatory Technology Development (PTD), Participatory Innovation Development (PID), and Farmer-led (Joint) Research. It’s an approach in which smallholder farmers research and innovate together for themselves to solve challenges. Most importantly, FLD provides the structure for documenting the innovation so that other farmers, across borders, can learn and use the technology and share the solutions. Farmers decide how they will document and share which can take the form of video, audio, text, story-telling, or dance depending on their preferred mode of communication. It is a process of community-led change. InsightShare provides such support with video documentation and has assisted communities in Côte d’Ivoire, Sierra Leone, Northeast India, and Sub-Saharan Africa. The primary values of FLD run parallel to participatory models and include creating a heightened state of inclusivity meaning that the people who are experiencing the challenges are the ones to solve them. Their problems are not solved by others swooping in to save the day. Second is information sharing combined with high collaboration. Unlike the top-down approach of the expert driven model, here everyone is both a learner and an expert creating equitable relationships. In this way, real-time challenges are successfully resolved creating a farmer-driven model as opposed to the industrial, top-down model. One success story comes from Cambodia where agriculture supports 6 out of 10 Cambodians. Here, Prolinnova’s (Promoting Local Innovation) network assists farmers, researchers, and development workers to find new ways of using local resources such as a new type of chicken feed without chemical additives. Within FLD, farmers and other support agents (NGOs, extensionists, etc) investigate ways to improve the livelihoods of the local people. As opposed to the industrial paradigm that treats farmers as recipients, this model treats farmers as active participants. In this process farmers are innovators and facilitators of their own future. It’s not about developing a community’s agriculture for them, but creating a process in which they develop their own agriculture for themselves. FLD has been used for land improvement, plant breeding, storage and processing, and natural resource management, among many others. Achievements have included greater food security through more dependable yields, better storage, and increased crop diversity compared to their previous practices. Farmer-led research often led to higher household incomes compared to conventional farming techniques using external inputs, primarily because of reduced costs, and allowing farmers to accumulate savings. In Burkina Faso improved planting pits called zaï were developed by an informal group of farmer innovators to improve soil, conserve water, and increase yields. Zaï are deep, wide pits for crops that capture water run-off from the surface of the land when it rains. These pits also provide space for rich sediment to remain in the pit which when combined with the water and composted manure, provide strong, healthy crops. This innovation was shared by a farmer-to-farmer extension project in the 1980’s and has doubled cereals in some areas from a quarter ton per hectare. All of this makes FLD inherently and inextricably linked to food sovereignty.  La Via Campesina, a peasant-led organization, defines food sovereignty as the “right of peoples to healthy and culturally appropriate food produced through ecologically sound and sustainable methods, and their right to define their own food and agriculture systems”. This definition looks at gender and economic empowerment of smallholder farmers while also maintaining an eye on ecological sustainability, making FLD a key component of realizing food sovereignty. If formal entities such as extension and other government agencies haven’t been driving FLD, who is? There are many organizations around the Global South like Prolinnova, MASIPAG (Farmer-Scientist Partnership for Development), InsightShare, and CEDAC (Community Economic Development Assistance Corporation) among many others who are promoting and facilitating this process. They work directly within communities to assist in gathering farmers together to innovate and collaborate, as well as providing technical assistance in documentation of their innovations. They provide the space in which farmers learn how to accomplish research, document, and facilitate future innovation sharing groups. Yet another, and perhaps the most important, purpose of these organizations is information sharing. They assist in sharing the documented innovations with other communities via their websites, social media outlets such as YouTube, and direct community outreach. Organizations promoting FLD have a twofold vision. They are looking to awaken an understanding of the farmers’ capacity to shape the world around them by giving them the confidence to innovate and create their own site-specific solutions. Secondly, they are looking at ways to break down the vicious cycle of poverty by reducing the use of industrial agriculture’s high costs. This is replaced with local and regional solutions using materials and knowledge already existing within their communities. For example, MASIPAG is a farmer-scientist partnership organization dating back to 1985 when their first project was to break the control held by multinational fertilizer and pesticide companies over Philippine farmers. Since then MASIPAG and farmers have worked together to cultivate their own varieties of seeds, moving from industrial farming practices to agroecological practices that require less input and costs for the farmer. However, it’s not all about removing external research and innovations that are happening abroad. For example, Prolinnova and Agrecol Andes look to combine local knowledge with external knowledge (national or international) where appropriate. The idea is not to remove outside innovation or knowledge, but to temper how and when it is used in a culturally-appropriate way. FLD isn’t widely heard of because it hasn’t completely taken hold amongst extension, NGOs, or other formal research and development organizations. Most reports do not show any significant changes in extension or other formal research NGOs’ paradigms or approach within knowledge transfer and sharing. However, sharing within farmer-to-farmer extensions have taken place, but has remained primarily within the specific communities utilizing it and their neighboring communities. One key to a participatory paradigm shift is sharing these innovations broadly between and within communities and countries. Why aren’t formal R&D agencies recognizing FLD? Mainly because many of the low-cost, low-risk technologies that smallholder farmers develop are not easily noticed by formal research and development actors, primarily since the innovations are scattered across villages. Because these innovations are fundamentally decentralized they are difficult to leverage into commercial opportunities on the part of the corporations who fund much of the R&D. Additionally, formal research entities tend to see the farmer-to-farmer research as not of high enough quality since they aren’t formal researchers with institutional backing and accreditation, nor are the projects conducted under the typical laboratory standards that define modern scientific studies. However, organizations like Prolinnova, Agrecol Andes, and CEDAC are working to bridge these divides so that participatory development becomes part of the culture and norm of how knowledge is shared and transferred. Prolinnova has targeted this as a key component of their mission so is working to institutionalize farmer-led documentation by working with extension and other agricultural research and development NGOs. Increased attention needs to be given to disseminating this research so that more smallholder farmers have access to it. A key function of government and extension could include sharing the innovations of farmers to their fellows more broadly. Another function they could serve is through validating the technology through scientific terms so that it is more widely accepted. Lastly, extensionists could become facilitators of FLD. Extension can easily play the role of facilitator by working with the organizations who are already promoting and assisting with FLD. They may help gather farmers and provide initial training in any documentation method desired. But the main process—what is recorded, who is interviewed, etc.—is all done by the farmers themselves. By doing this farmers are empowered to own their solutions and actions. Quite possibly the largest cultural shift required will be to create an environment wherein everybody will view the local solutions as equally important and critical as the more formal western research that they typically provide. There is a need to increase recognition of FLD within the general populations of both formal entities and farmers alike. Aside from supporting organizations like Prolinnova who are already working to institutionalize FLD, there are things that all of us can do no matter where we live. Remember, FLD is a type of participatory development. In the United States, we see this type of model quite often in schools and companies where each individual is valued for their knowledge. Participatory development provides the space for individuals to feel empowered and gives them the confidence to solve their own problems by building the agenda, guiding the discussion, and creating solutions. FLD is one model within the broad toolbox of participatory development and research. One way to promote this important paradigm shift is to share the stories of smallholder farmers working within the model of participatory development using FLD. The more their stories are shared the more people know, understand, and can begin to appreciate their process. There are always different ways of viewing a situation, and even more, solving a problem. A facilitator’s job is to hold multiple perspectives while still being able to function. This is what the aforementioned organizations are doing. It is something that we all can do, as well as learning to appreciate that there are many ways to solve a problem, and usually the people with the best ideas are those experiencing the problem directly. Who better to turn to for a solution than those that know the issue most intimately? 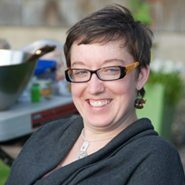 Laura is a community food organizer and facilitator who creates space for people to think about their interactions with their community and the world around them. She grew up in Indiana where she co-founded the Indianapolis Food, Farm and Family Coalition and has worked with local and government agencies promoting food growers and producers in Wisconsin. Laura currently holds an M.A. in Environment and Community from Antioch University and resides in Seattle, Washington. AGC’s New website looks great and very interactive! We look forward to interacting with the different actors as you strive to bring farmers back to the forefront of the food production system. My view is that these are very complex issues and it’s very difficult to write well about them, especially globally, especially in the internet age. I find that there’s much of great value here, but also a number of points that are overly simplistic and misleading (and “gone viral”). For one thing, there isn’t a “food system,” but rather is a farm and food/nonfood system. Second, “industrial” has been chosen (virally) as a word that’s only negative, and while there’s much truth in that, there are also profound falsehoods in it. There is also much that is essential in the industrial. To suggest that “once industrialized farming took hold in the Industrial North, farmers began to rely on agricultural experts” (leading to various negative results) certainly has some general truth related to it, but is simplistically false in at least several ways. In important ways, what happened happened off of farms, in agribusiness. You might want to ask the farmers themselves, before concluding that the changes came from their “relying on agricultural experts,” (not that they necessarily remember or have philosophically processed these issues). There is a package of interrelated injustices (or forces) that has been changing the capitalization of farms, the choices available, the infrastructure available, etc. The quoted definition of Food Sovereignty is inadequate in light of the actual work of La Via Campesina and others, as, in emphasizing local self control, it leaves out the whole realm of their macro policy emphasis, which relies on government intervention. https://zcomm.org/zblogs/food-sovereignty-as-government-intervention/ In light of the oppression of farmers, North and South, “Exodus” strategies of withdrawal from the dominant system are essential, but so are “Jubilee” strategies of macro reform. This is certainly a valuable contribution to the literature. Unfortunately, much that’s known to the grassroots farm side remains offline, unresearched, unwritten, inaccessible to current interpreters. I would like to get your contact details so we can discuss a few things. I work for Musika Development Initiatives in Zambia.